Two blades of grass were enough for the Wallabies to get away with an unlikely win in Brisbane yet the reality is that they'll be chewed up and spat out like lawn trimmings if they repeat that performance at the Rugby World Cup later this year. Tevita Kuridrani's 82nd-minute try ensured the Wallabies will enjoy a much happier trip to Mendoza than what they experienced last year - think Di Patston and Kurtley Beale - but the arduous journey to South America more importantly gives Michael Cheika the time to consider his options in a couple of key problems areas. Badly beaten up front in the first half, the Wallabies were guilty of not putting enough numbers into the breakdown despite Springboks coach Heyneke Meyer revealing ahead of the Test that his back-row trio of Francois Louw, Marcell Coetzee and Schalk Burger had been chosen in the anticipation of a "massive contest for the ball". It was one-way traffic in the first 40. A lot of that blame has been unfairly pointed at Wallabies openside Michael Hooper, but the truth is the No.7 received little assistance from his fellow back-rower or the remainder of the Wallabies pack. One first-half penalty perhaps showed that better than any other as three Springboks forwards tore into a breakdown against a solitary Wallabies rival; meanwhile, front-rowers James Slipper, Stephen Moore and Sekope Kepu stood in a perfect 1-2-3 alignment watching it all unfold inside them. But the bigger issue was that the Wallabies back-row trio played far too loose; and it wasn't until the introduction of David Pocock that anything close to parity at the breakdown was restored. Scott Higginbotham and Scott Fardy both enjoyed space out wide, but they were fleeting moments on the counter and only a minor part of their designated roles. Hooper's team-high 12 tackles would seemingly bury any doubt over his defensive work-rate, as would his match-turning tackle on Burger that brought the Wallabies an attacking five-metre scrum from which he soon scored. Pocock's introduction lightened Hooper's load and, as has become the 23-year-old's trademark, the No.7 then played well above his weight to be Australia's most potent forward ball-carrier. The Hooper-Pocock tag-team looks likely for Mendoza but the bigger call will be to use the twin No.7s against the All Blacks a fortnight later, and see how they combat the world-class trio of Jerome Kaino, Richie McCaw and Kieran Read. 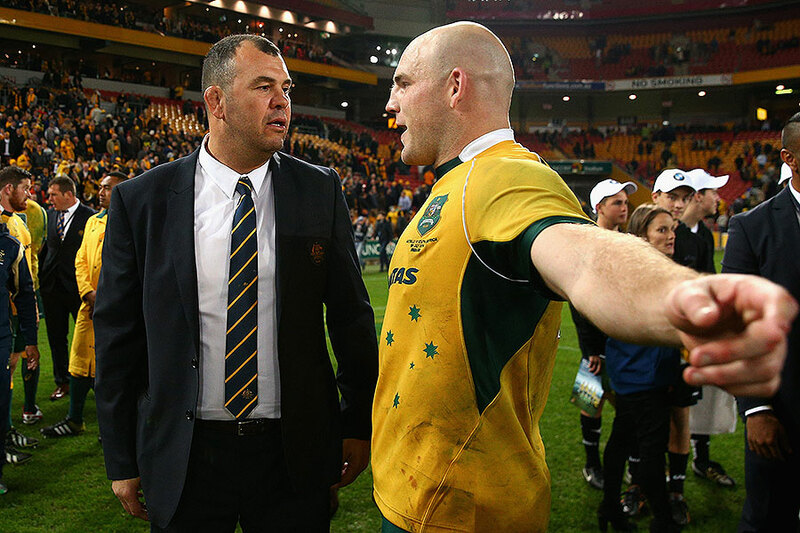 Cheika's other chief concern is an old Wallabies favourite and, like the breakdown, it was largely a first-half issue in Brisbane on Saturday. The Wallabies' scrum was under huge pressure through the first 40 minutes but the set-piece was awarded two penalties of its own after the introduction of Greg Holmes - playing his first Test in seven years - and Scott Sio. This turnaround needs to be tempered by the understand that Meyer had, curiously, substituted all his starting front-row of Jannie and Bismarck du Plessis and Tendai Mtawarira within three minutes of each other after half-time. Cheika may be inclined to give both James Slipper and Sekope Kepu another chance against the Pumas though the chance to start his second-half tyros from Brisbane will also be tempting. And perhaps that is where the secret lies: experimentation. The ongoing dialogue about the misgivings a Hooper-Pocock combination present are based on the George Smith-Phil Waugh dynamic Eddie Jones implemented. That was 12 years ago. And as for the scrum, surely Holmes and Sio deserve the chance to prove their success wasn't merely down to the fact that they were up against the Springboks' second-choice front-row. Slipper and Kepu virtually had a mortgage on the loose- and tight-head roles throughout 2014 and Cheika got a first-hand view of that on last year's European tour. He knows what they can do. The Wallabies have secured some unlikely momentum thanks largely to a bold decision from Moore to spurn three points and a draw by kicking for touch ahead of Kuridrani's try. The long trip to Mendoza provides Cheika plenty of time to consider his selections; so to a reflection on the skipper's gutsy call.